We know that our kids are going to imitate us. We’re role models. That gives us enormous power that we need to use as a force for good. Lots of the things that come out of my mouth during the day are all part of me trying to raise happy, healthy, successful and self-confident girls that people like to be around. I want them to show kindness and respect to others, acceptance of others and politeness. I want them to do their best and be able to overcome obstacles and make good decisions. They need to see us taking care of ourselves, following through on something we’ve said, apologising and admitting mistakes and talking openly and honestly. I want them to see that we don’t give up, even when things get challenging. Maybe they’ll only articulate that in a eulogy at my funeral. Maybe not even then. That’s fine. As long as they’re doing it. It’s not only the things we’ve said that we hear coming back out of our children’s mouths. It’s the things they see us do. Look at this photo I took when I found Elsie and Maeve playing in the car today. 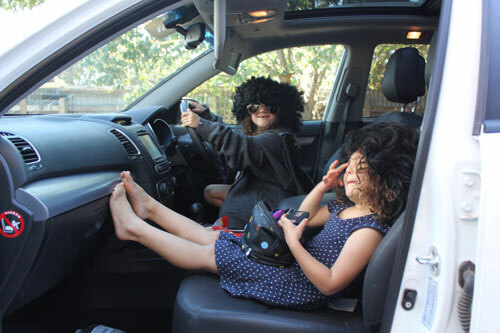 I hadn’t unpacked the car from our road trip to a dress up party. ‘We’re being you and Dad,’ Elsie said as I opened the door. Elsie had Anthony’s jumper and sunnies on and Maeve was sitting with her feet up on the dash putting a bit of makeup on. I’m a positive role model, no? Seriously though, Avalon recently decided to have a change of hair do, from very long to very short and she said quite strongly that she didn’t care what any body thought! Sounded just like what I would say. Your doing a great job on your girls. Well done! Groovy baby!! Does that mean you passenger with your feet on the dash too??? I’m afraid my children are way more influenced by their peers rather than the amazingly perfect example I set as a parent – bring on the teenage years!!! Usually the foot well is so full of handbag, drinkers, bananas, etc that often feet on the dash are required! Not looking forward to the day peers take over as the role models! We’re all amazingly perfect and really cool – don’t our kids see that?